(1) "The school retains the right to exceptionally increase the ratio to 1:30 when the situation warrants." •	Positive Education philosophy underpinning school can be over complicated in some explanations. •	At its best a gem of a school, but, perhaps understandably, one that has been (unfairly) overshadowed by the investment and quality of its newer "bells and whistles" trailblazing slipstream Sunmarke. Moving forward as a dedicated FS-Primary, Regent International School has everything in place to shine across the board. On the basis of our 2017-18 visits we left genuinely impressed - Fortes though must ensure that Regent secures as much focus and investment as its shiny new sister Sunmarke moving forward. 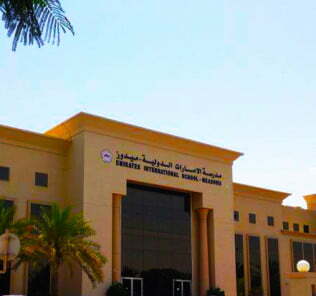 Whatever the KHDA verdict this is a school, in our view, that functions on a day-to-day basis as a Very Good school for its children or higher. The combination of Regent International and Sunmarke schools, taken together, as an educational journey for children, is quite something. “Regent International School has been serving families within the community of The Greens (and far beyond) for over 25 years. We are a well-established and much-loved Early Years and Primary school with a nurturing ethos underpinned by a Positive Education philosophy and the highest expectations of all of our pupils. We pride ourselves on achieving the school vision of enlightening every child and empowering every member of our learning community in order for all of our pupils to excel academically and socially. The pupils are truly the heartbeat of our school and their passions and interests form an integral part of our outstanding and unique curriculum. Over the 25 years, Regent has evolved and developed into the caring and successful thinking community that it is today, with a focus and priority on developing philosophy for children and critical thinking through the development of thinking tools and good quality dialogue. We are developing enquirers, problem solvers, entrepreneurs and communicators who will gain the skills to thrive in our ever-changing world. Furthermore, through our Values in Action Curriculum, we are developing the skills of self-awareness, empathy and compassion, which leads to increased well-being and emotional intelligence. Gaynor Dale, Head of Whole School. 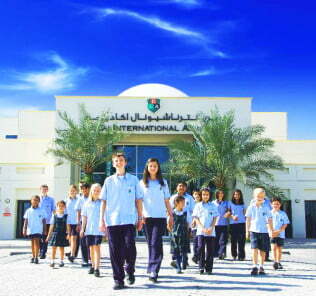 Regent International School Dubai. Regent International School [RIS] is at a stage in its history where it faces opportunities. Established in 1993, in 2016-17 its owners, Fortes Education, took the decision to build a new school for its secondary children that would see them move from Regent to the flagship Tier 1 Sunmarke School in September 2016. Our review of Sunmarke can be found here. The aim is that children in FS1 – Year 6 would have sufficient room to benefit from an outstanding, focused education. After many years of growth, and with demand outstripping supply, the existing full phase FS1 – Year 13 British school had simply outgrown its campus. From September 2016, Regent International School has had the opportunity to build within the existing Regent framework and campus a new dedicated FS-Primary, the school in many ways started by its founding owners the Mankani family originally, but with all the benefits of almost a quarter of a century’s experience behind it, and a new, seamless slipstream for children to move to the new landmark campus of Sunmarke from Grade 7. Our view, based on our own visits, comparative school data and feedback from parents, teachers and children, is that Regent International School more than warrants at least a “Very Good” rating and we believe the KHDA review justifies this even on its own terms. Although Regent international School has missed an Outstanding rating in leadership, facilities and governance, this will have been in no small part caused by the considerable pressures of planning a new school in concert with running an existing one. This pressure should dissipate as Sunmarke comes on stream and beds in – and Regent International School, as a dedicated Primary, is given the freedom to focus on specialised provision for its younger children. Following our 2017-18 visit to the school, we can report that the decision by the school’s owners to separate out FS to Year 6 provision with the establishment of Sunmarke is delivering in extraordinary ways to the benefit of children. 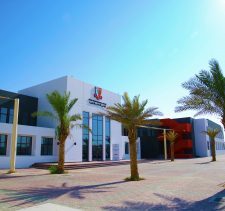 We certainly, on the basis of our visit, expect the school to achieve at least a very good rating at its next KHDA inspection, notwithstanding our comments above about its already operating at at least this level for children.. Simplifying our findings somewhat, what we found was a school with a very clear determination to establish itself as one dedicated to the specific needs and demands of its younger role. A very simple example, the use of age appropriate quotations in the reception area, is extended across the school, the aim being to set the scene for students of the opportunities and ethical framework of the school, and to nurture an inspirational school environment in which children are encouraged to question and build a love of learning for its own sake. 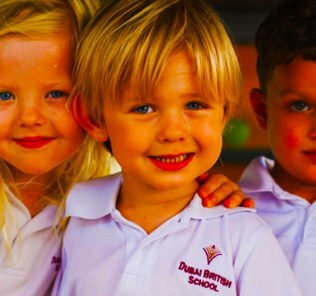 Much of the background to Regent International School culture has been forged in the relationship the school has developed, through its owners, with the prestigious Geelong Grammar School, arguably in Australia’s top-five schools. Regent has leveraged its own variant of Geelong’s “Positive Education” model of teaching and school culture, an educational approach which, broadly speaking, seeks to empower in each child the confidence of their own inherent gifts and capacity to learn. 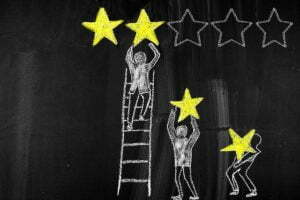 One aspect of this, nurturing emotional intelligence, is increasingly being seen as the critical differentiator of the highest achieving leaders in business and industry. The stakes could not be higher. Underpinning the approach is that no child should ever be left behind, or doubt their capacity and potential to achieve. In many schools, the impact of a teacher, rather than child-led, authoritarian approach to learning, results, the approach argues, in many children doubting their own abilities – this in turn creating a self-fulfilling cycle in which children achieve poorly against their potential. One tool of the approach adopted at Regent International School, mindfulness, for example, has been integrated at Regent for many years and is only now becoming a component of the Dubai Inspectorate of School’s toolbox to drive up standards across the emirate’s schools. We found other examples of the approach in the (genuinely inspiring) display boards used throughout the school. 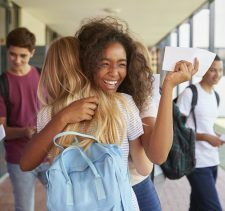 Good examples range from a ‘Random Acts of Kindness’ Board to those encouraging a “Growth Mindset”, how to “Float away from Failure – Sail to Success” and a “Positivity Patrol”, each made by a student from each class. 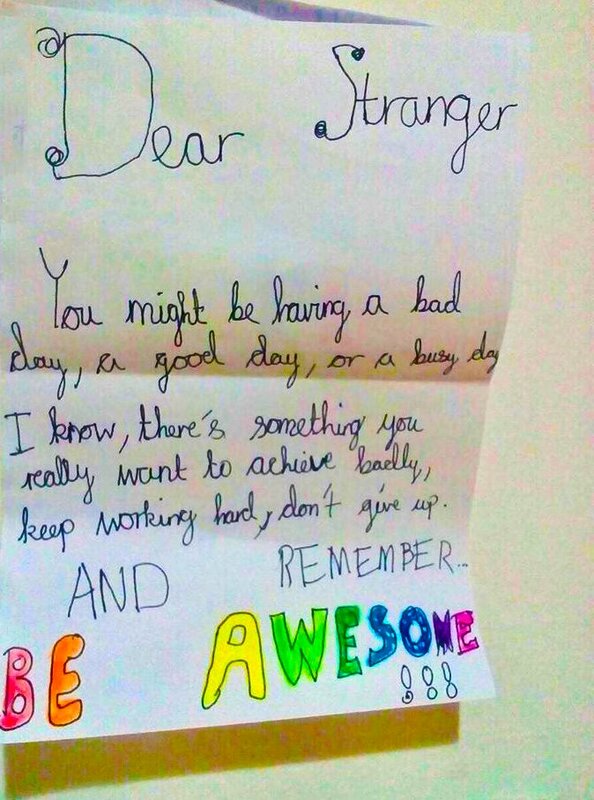 Another inspirational initiative has been the development of a series of “Dear Stranger” messages posted in open envelopes along the walls and corridors of the school. Children were encouraged to open them to discover messages of support and affirmation. More on the global network that underpins Positive Education, together with a large number of inspiring lesson plans examples that bring the philosophy underpinning Regent International School (and its slipstream Sunmarke School), can be found here. It is worth noting that a significant number of KHDA faculty are represented within the Positive Education Board and staff. 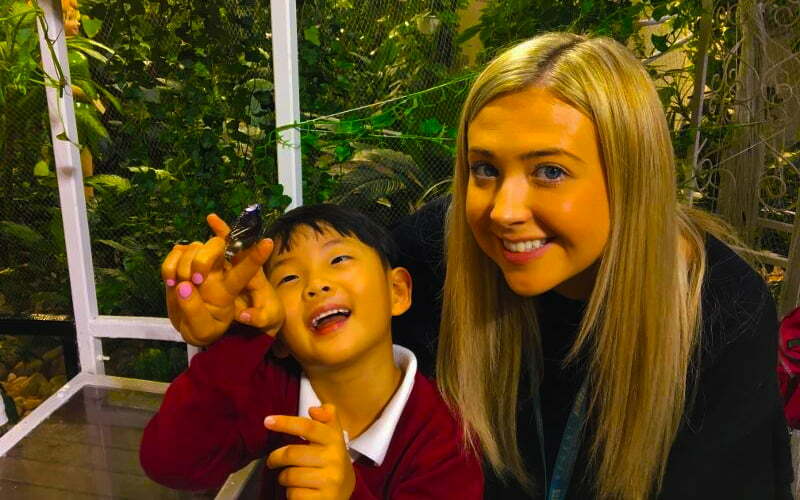 Of her many drivers, a key focus at Regent International School has been in developing Special Educational Need (SEN) provision (a rare weakness of the school identified by the KHDA prior to her appointment). Provision for SEN today is strong with 3 dedicated centres and 8 full-time staff specifically focused on SEND and English language Learners (ELL). Approximately 5% of the children are identified with a SEN need. 50% of children have some moderate degree of English as an Additional Language requirement. The school’s approach is to integrate SEN provision within the as much as possible to ensure that no child is left isolated, and that all children recognise that strengths and weaknesses are very much part of the human story. This builds on a whole school approach that seeks to nurture confidence and shared respect. 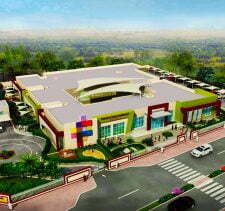 Regent International School currently provides an education for 1000 students. Capacity of the school is around 1200 students. 76 nationalities are currently represented. Class sizes are capped between 22 and 26 students according to year with dedicated Teaching Assistants for all classes from FS1 to Year 2. Between Year 3 and Year 6, TAs are shared between classes according to identified need. Facilities that specifically drew our attention during our visit included the 2 dining areas; 2 Multipurpose Sports Halls; the (fabulously welcoming and welcoming) library; a Radio Broadcast Room for children between Years 4 and 6 (a podcast is available on the school’s website which brings this to life); and a Wellbeing Room. As a whole, facilities at the school are excellent including 75 individual “Activity Rooms”; specialist laboratories for individual Sciences; ICT labs; design and technology labs for food technology and specialized robotics/programming; art studios; performing arts studios for dance and movement; music rooms; drama and rehearsal spaces; fine arts rooms, prayer rooms and libraries matched to individual phases. Sports facilities at Regent international School include, as above, a multi-purpose sports hall (which doubles as a theatre for performances); multi-court “Sports Decks” for ball games; 2 heated swimming pools including a learner pool; and (heated) shaded outdoor “Play Zones” for each phase including an EYFS Play Zone and outdoor pitches for games and athletics. One standout feature that shows how facilities are being used to build relationships with parents is,the “drop-in “period now set aside each Thursday for parents to speak with teachers about their child’s progress. The school conducts regular workshops and the now ubiquitous on-line communications portal is used to good effect. More importantly, communication with parents is seen as integral to good schooling. Very strong physical connections throughout the school reinforcing Positive Education and whole child development. Examples are legion but including a Happiness Hallway (“10 Steps to Happiness”) and “Flourisg Points”we recommend parents experiencing on visits to the school. “The use of related Thinking Tools in classrooms is having a direct and significant impact on standards. The new (inspirational) nursery now opened in the Foundation Wing identity has been thoughtfully physically separated from the main school to ensure that younger children can develop at their own pace and with education directly targeted to their needs. This investment is a direct response to the wishes of parents. A big focus on Science is very evident and from Year 1. Science Stars displays in corridors are used to great effect. 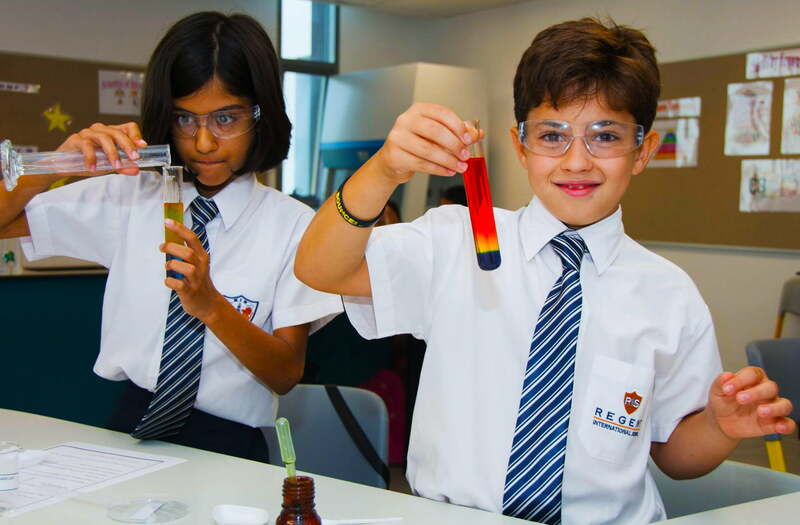 STEAM is subject to significant investment and recognised by the KHDA in both its Very Good and Outstanding awards at FS and Primary phases respectively. Dedicated Music and Information Technology facilities are fully resourced and impressive. Investment in a new Head of Arabic with a proven record of securing outstanding results is expected to see significant improvements in an area in which all English language schools have difficulty. We really like this school. 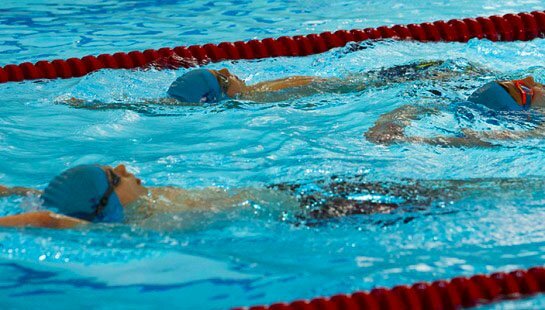 There is something to be said for a school being able to offer dedicated FS-primary provision – and here there is the guarantee at the end of the journey of seamless transition to Sunmarke, the school’s own slipstream senior school. Regent International School is now, without any doubt, much better able to focus on the very special learning needs of young children. There have, to be balanced, been some parental frustrations at the distance from the Hills of Sunmarke because of the logistical difficulties faced by parents of siblings with children at both schools. However, to give credit to both schools, both Regent International and Sunmarke schools have gone to extraordinary lengths to resolve these through timetabling and bus provision. This aside, what stands out at Regent International School is an ethic of learning rooted in the belief that every child has the capacity to make a genuine difference – and it is this individualised focus that shone through above all for us on our visit. Children are genuinely happy, inspired and engaged. 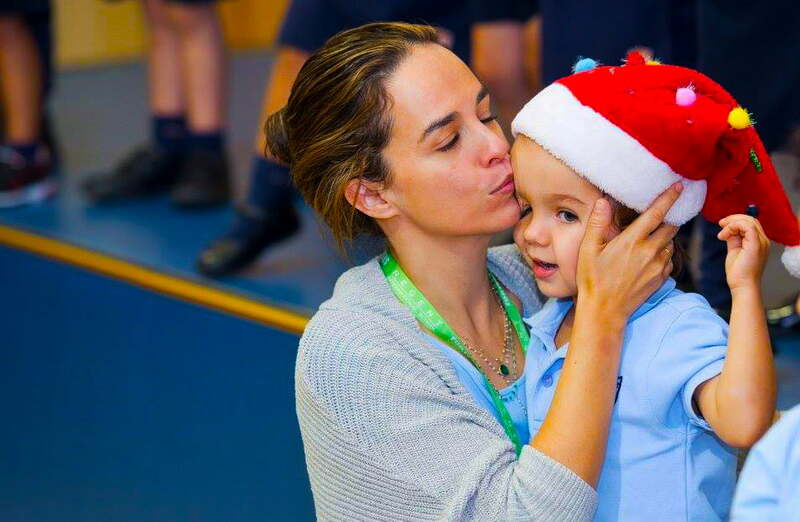 The decision of the school’s new Principal, in moving to Regent International School from the outstanding UK school she led and which had become her home and vocation, is telling too of the real potential of the school and its very distinct ethics and ambition for children. It clearly took something very special indeed to attract her – and which we clearly found evident on our visit. Regent International School comes highly recommended. My daughter started at Regent in Year 2. 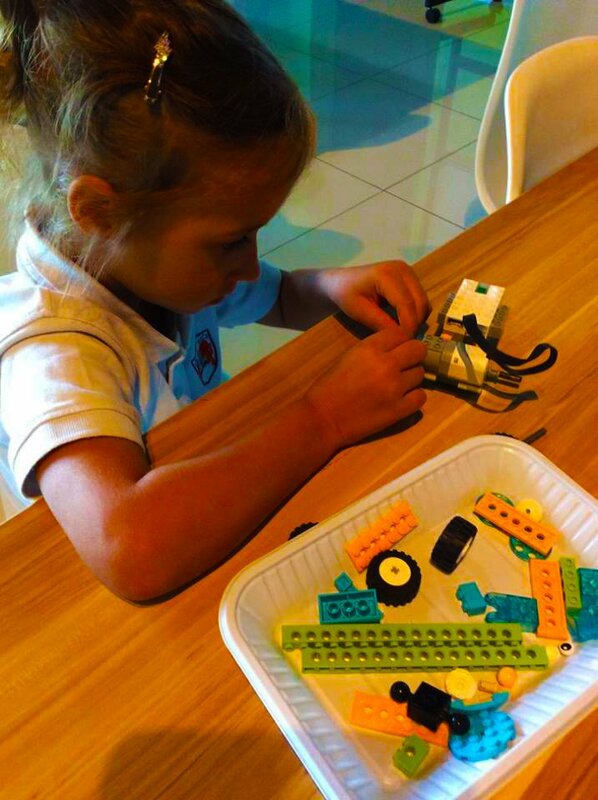 Initially, we were worried about the transition, but it was the best move we made for our daughter’s future. The amazing part is that the principal, Mrs Dale and every SLT member encourage a child’s individuality to really shine through. During our morning drop-offs, I find it really nice that the Principal and Teachers greet us and know my child by name. The Positive Education curriculum at Regent and the activities planned around it makes the school our partner in parenting and educating my child.